Festival fever is set to grip tyre manufacturer Firestone after the brand announced its sponsorship of this summer’s Download Festival. 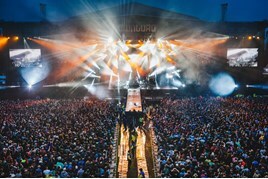 The popular tyre brand said that its partnership with the event, which comes to Donington between June 10th and 12th, is part of ongoing efforts to gain traction with "a vibrant, exuberant audience through music”. In addition to activities run by Firestone at the Download Festival, the brand will run bespoke campaigns through its social networking channels to reach its 850,000-strong audience on Facebook, Twitter and Instagram. Firestone’s brand manager Stuart Attfield said: “We see this partnership with Download as being brave, bold and full of originality. We think it is unique for the tyre industry to be thinking along these lines. “Download Festival is the perfect opportunity for us to position ourselves within a passionate community known for its credibility and knowledge of the music scene.